I am thrilled at how excited everyone got over the celestial event and looked to our libraries as a resource. My family and I traveled up to be in the line of totality and viewed the eclipse at a library in Chesterfield, Missouri. But I know that many of you are resting easier now that the eclipse is past. Librarians all over the country have been calling eclipse glasses the new tax forms. Now that the dust has settled, did you find that you were left with many discarded glasses? Or perhaps they all disappeared. As many of you probably know, we are going to be getting a wonderful show right here in our own backyards in 2024. If your discarded glasses comply with NASA’s safety standards, the glasses should be reusable indefinitely… as long as they don’t get scratches. So if you were thinking of hoarding those glasses now for 2024, make sure they are stored in such a way that they won’t get scratched. If you would rather them be gone, Astronomers Without Boarders is working on a plan to collect and redistribute to other areas around the world experiencing an eclipse. Details should be forthcoming soon on their website. Additionally, you can tear the lenses out and simply recycle the cardboard frames. This Smithsonian post suggests using the lenses in arts and crafts projects to make a souvenir of the event. Sounds like a wonderful programming idea! Please send us pictures and information about your eclipse programs! How many were in attendance? What did you learn to prepare us for 2024? Do you have a 3D printer at your library? NASA has shared the .STL file for a pinhole projector in the shape of Texas! Even if you don’t have a 3D printer, that website also has PDFs for making them out of card stock and other inexpensive ideas for safely viewing the eclipse. Please email us and tell us how you plan to celebrate the eclipse at your library! Get more tips like this in our upcoming monthly newsletter. You can sign up here! When you are making Amazon purchases, please remember that you can continue to support the work CTLS does by shopping through Amazon Smile. Of course, this is also our reminder that you can set up a similar Smile account for your library/Friends group and share this with your community! Amazon will donate 0.5% of the price of eligible AmazonSmile purchases. You can learn more about getting started here. Have any of you done this? Have you found it to be worthwhile? Please share with us your experience! Is Your Library Ready for the Celestial Event of the Century? See the note below from Paul B. Dusenbery, Director of the Space Science Institute about the eclipse that will take place in August of 2017. 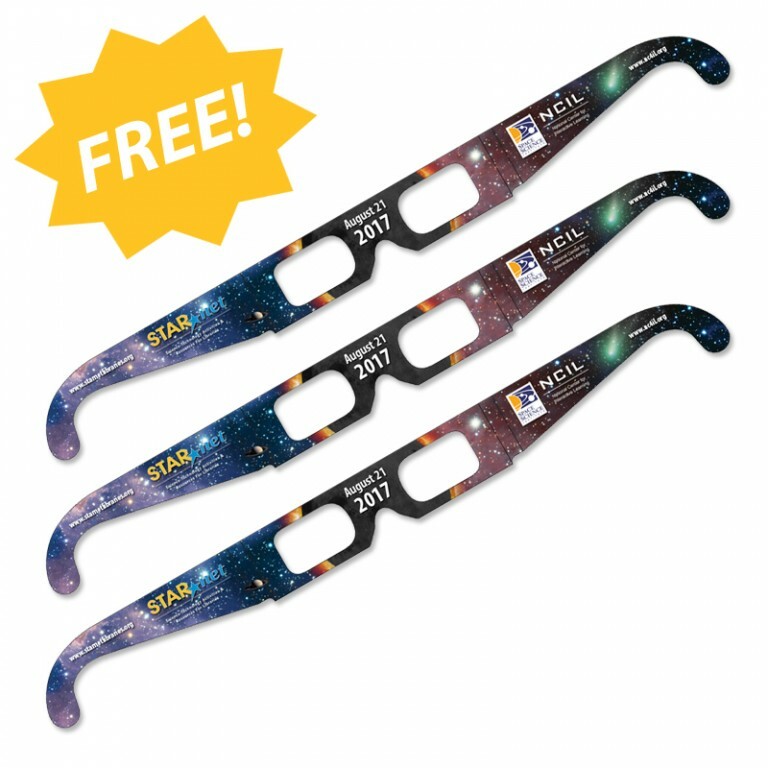 If you register your library, they will provide many great resources and will even send you 50 free some solar viewing shades! Are you ready for the celestial event of the century? In just over a year from now (August 21, 2017), the shadow of the moon will sweep across the United States from the Pacific Ocean to the Atlantic Ocean in a spectacle that hasn’t occurred in 99 years! The National Center for Interactive Learning (NCIL) at the Space Science Institute has recently been awarded a grant for its NASA@ My Library program. Partners include NASA, ALA, The Girl Scouts, SETI, and many other organizations. The STAR Library Education Network (STAR_Net) is managed by NCIL. The STAR_Net team wants to work with your library and thousands of others to participate in this national event. Some fortunate libraries will be able to experience a total solar eclipse though every library in the country will observe at least a partial eclipse. When your eclipse event is planned, you can share your press release, flyer, website link, or like material with us to receive 50 free Solar Shades for your patrons to watch along with us! (shades are available on a first come, first serve basis). Paul Waak recently paid a visit to the Johnson City Library to help install the CTLS rotating Exoplanet Kiosk. The exhibit is an interactive kiosk that gets constant updates from the Kepler mission, which is searching for Earth-like exoplanets, planets that orbit another sun outside of our solar system, throughout the galaxy. The kiosk gets live updates from the Space Science Center or Jet Propulsion Labs with any breaking discoveries. So far, the kiosk has visited Pflugerville, Taylor, Wells Branch, Harker Heights, and Johnson City. The Collaborative Summer Library Program has created PSAs for your library to use to help promote your summer reading program! They are downloadable from their website, can be customized to include information about your library, are in English and Spanish, and there are a variety to pick from. You can embed them to your website or share them on social media to help spread the word! Go check them out! Are you on Pinterest? If so, we have created an Summer Reading Program 2016 board to collect ideas. We are sharing images of crafts and activities from the manual as well as other theme related ideas. Please contribute to the board or just watch it to get some good ideas! If you are new to Pinterest, this could be a great way to get your feet wet. It is a great place to get and share ideas! Contact Katelyn Patterson with any questions you might have. Do you have a collection of Large Print books? Or maybe you are part of the CTLS Large Print Collection rotation? I wanted to make you aware of a free Booklist webinar called Best Practices for Large Print: Ideas, Resources and Reads coming up on Tuesday, November 10, 2015 1:00 pm (CST) that might be of interest to you! Click through for more information and to register to attend. Thea Blair, Manager of Continuing Education & Consulting Services at the Texas State Library and Archives Commission, has posted a web page <https://www.tsl.texas.gov/ld/pubs/opencarry.html> and a blog entry <https://www.tsl.texas.gov/ld/librarydevelopments/?p=18734> about the new handgun laws in Texas. This is not legal counsel but is a great starting point for any conversation on the issue. Topics covered include non-profit libraries and school events at libraries. Thank you to Thea, Mark Smith, and TSLAC for stepping forward on this. March has been a busy time for ‘Bots and Books participating libraries. Many did kick off camps and teasers for their summer reading programs during Spring Break. Thank you to all the libraries who are sharing their stories, lessons learned, and pict ures with us!